We live in the exponential age. Progress is happening at exponentially increasing rates. Jobs – and indeed whole industries – are being made redundant. There will be more change in this generation than in the 200 years leading up to it. This is a fascinating idea, but what do we do with it? How do we react in the face of it? How do we evolve to keep ourselves relevant? How do we guide our children to best prepare them for the future? Since the advent of traditional education forms, and the factory-like structures necessary to deliver them, there has been a huge focus on content-driven learning. Reading, writing and arithmetic have been favoured as the measurement of success. Students are tested on their ability to memorise knowledge above their ability to create it. Yet as knowledge becomes freely available to the highest level of detail, and workplaces seek employees able to innovate and create, the skillsets that we currently value are not the ones that will take the next generation forward. If reading, writing and arithmetic are not enough for the future, what skills do we need to be developing instead? If you listen to the Australian Government, they are proclaiming a future that requires us to focus on Science, Technology, Engineering and Mathematics. This push is part of an initiative by the Department of Education and Training called Students First. On the 7th December 2015 the Australian Government released the National Innovation and Science Agenda, with the core strategy being to inspire all Australians in digital literacy and STEM. In the USA we are seeing a push towards coding and cognitive load coping. In Scandinavia, the Ashoka program aims to connect and build ‘changemaker schools’ – schools that focus on developing the changemaker skills of empathy, creativity, leadership, and teamwork. Who else is talking? What are the trends from those with the foresight to plan for the future? Fast Company interviewed futurists and identified ten amazing future careers. These include Professional Tribers, Personal Brand Coaches and Urban Farmers. Check out the rest of their predictions. What’s different about these, compared to the careers we currently see dominating the workforce? 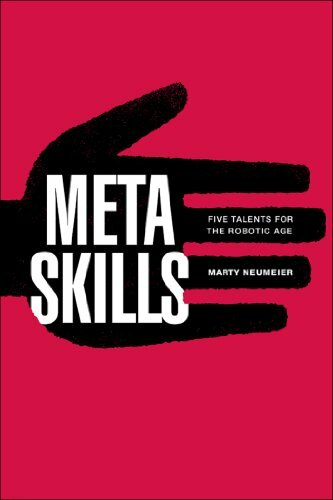 In Meta Skills, Marty Neumeier suggests a different set of skills. Neumeier is a past editor of Critique magazine, and is an authority on design thinking. He starts his book with a statement coupled with a question. ‘EEK a robot ate my job, now what?’ He then continues on to to explore five metaskills he suggests we will need to thrive in the age of robots. These are; feeling, seeing, dreaming, making and learning. The fifth one – learning – positioned metaphorically as the opposable thumb of skills. Nice. A group called the Institute for the Future, based at the University of Phoenix Research Institute, have addressed the question of future skills directly in their report Work Skills 2020. Their list of skills is a result of a pretty impressive line up of thinkers in the space of change, disruption, and the future, including Steve Milovich from the Disney Corporation, Sonny Jandial from Procter and Gamble, and Micah Arnold from the Apollo Group. Their work identifies six drivers of change and ten skills we need to develop in response to those drivers. Virtual collaboration — Ability to work productively, drive engagement, and demonstrate presence as a member of a virtual team. We can see how the Institute for the Future has used the drivers of change to form this list of ten skills for the future. Each skill is influenced by one or more drivers. Pattern recognition — similar to the idea of sense making, but with a bias towards data points and joining the dots for action. It’s about seeing the forest and the trees, and creating an insight that drives change. Value matching — this is an idea rooted in client-centric business models, leadership engagement strategies and good old-fashioned sales and marketing. We need to be able to connect value from one side to the other. Innovative Design — This is about making sure that what you do is solution-centred and directed towards affecting the human condition. Your work must make things better. Which among these predictions will end up the most prescient? Of course, we cannot know. The key is to remember that what is most valuable today – those things that you (and your children) are put under pressure to focus on – will not be what is most valuable tomorrow. If, as we look forward, we think about skills in terms of what we will need, not what is currently valued, then we have taken the first step to success in a changing world.